By providing excellent customer care, Jeff Ehrlich has built a good reputation and established clientele. His services are often recommended by others. 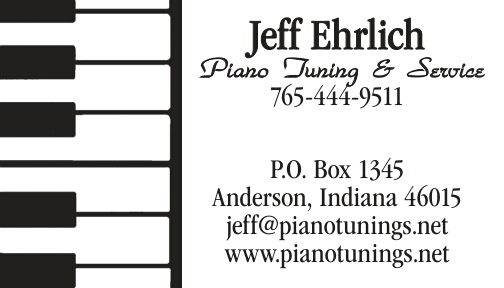 Serving Anderson, Muncie, New Castle and Surrounding Areas, Since 2009. Includes up to 2 hours of tuning and service. Includes time to tune the piano. Allows a little extra time to make a couple of minor repairs at no extra cost for labor. Fix a few sticky keys. Resolve minor tuning pin issues. Remove debris and foreign objects from the piano. If piano is severely flat. It may be necessary to complete a pitch raise, for an extra fee, to reach the proper pitch. If a pitch raise is not possible or desired, then tuning the piano its current pitch is an option. For quality work and great service schedule your appointment now. This Yamaha C-7 is one of my favorites to tune.